In the PADI Rescue Diver dvd they call it ‘Serious Fun’ when it should be more accurately titled “Seriously tiring”. It isn’t just the physical aspects of the rescue diving course that tires you out. The mental aspects of being constantly alert to danger is what takes the toll on you. But it is not all gloom and doom. The course itself is very fun. It has its moments of sheer slapstick comedy you could only find on a television sitcom. My course was a devious plot from the start. I had been informed that my open water scenarios would be held a day later. So i was pretty much not thinking about it while enjoying my 2 fun dives. Well, that is abit of a stretch. My first fun dive left me scratched from trying to do a walrus beach assault speciality(that is a whole different story) So i was taken by surprise when someone while snorkelling suddenly shouted he had a cramp and was struggling. It didn’t strike me yet that it was a test so i responded as the training instructed. Stop Breathe Act. I didn’t jump into the water straightaway as what i would have done. I looked around the boat and found a life buoy with rope attached and swung it out. Sure after that i had to swim in and rescue a “panicked” snorkeller. The devious part was that the instructor didn’t wait for me to heal up from my scratched incident at the rocks. He cunningly used that as a stress test and threw me into the fire. It was a good thing i was pretty ready. I am glad i went through the course. It has taught me a valuable lesson in keeping my head together and not panicking. It also allowed me to see my first shark ever. Now THAT IS SERIOUS FUN! Planet Scuba India is taking you to India’s very own beautiful and exotic Andamans for the next Big Dive Trip!! 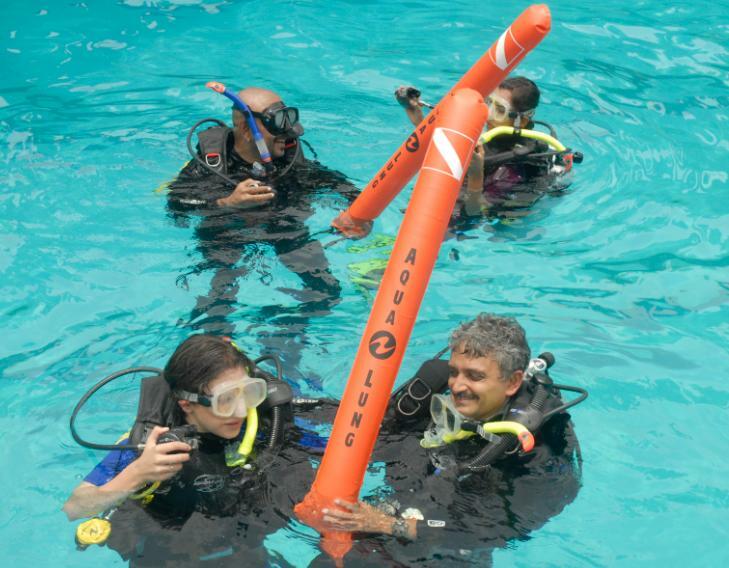 Join the growing army of Scuba Divers of the Bangalore Dive Club for this unforgettable tour! Get your friends and family along. Its a deal you cannot afford to miss!! What’s more, this deal gives you more than just a dive trip. We have arranged training programs that fit right in so if you or your friends cannot dive, learn before you go to the Andamans. Once you are there, plunge right into the sea. As a special arrangement, our instructor, David Perry, has arranged one PADI Open Water Diver certification program (3 days, 3 hours a day and one day in the Pool or as you fix up with the instructor) and, during the trip, an Advanced Open Water Diver Course. It can’t get better than this. REGISTER NOW! Just call us and we will register you. Andamans’ Havelock Island is a beautiful place to dive at this time of the year. choose fabulous dive sites and take rest and get ready to dive next day.